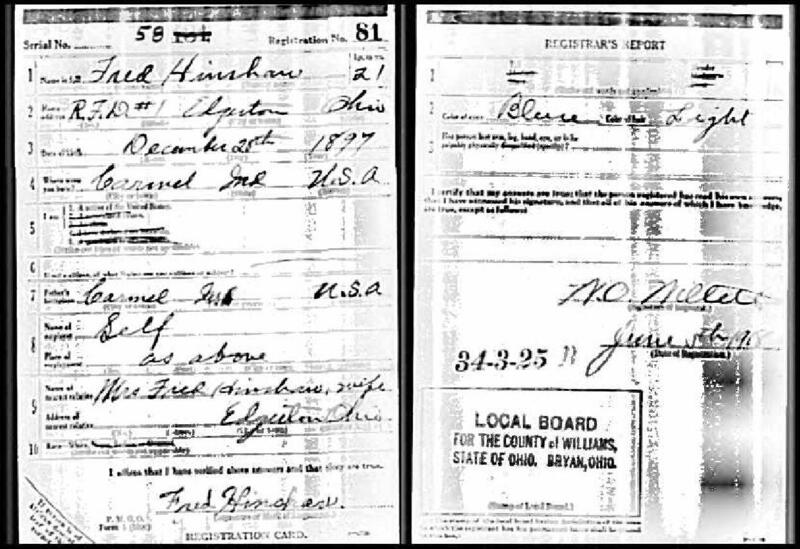 Born Dec 28 18961,2,3,4,6,7,8 [Dec 28 18979, about 190410], Carmel, Hamilton County, Indiana1,2,3,4,6,7,8. Note that there is uncertaintly about Fred's birthdate. In the earliest record of him, the 1910 census, he was shown 6 years old, making his birth about 1904. But in later records, including records where he himself declared his birthdate, he was always recorded born before 1900, in fact born before his parents' marriage in 1905. Fred himself was somewhat inconsistent, declaring his birthdate in 1918 as Dec 28 1897,9 but in 1942 as Dec 28 1896.8 It is possible that he wasn't sure of his own exact birthdate11 (it did happen), or perhaps he wanted to pretend to be older.11 Fred's father was shown in the 1900 census as still single, and Fred doesn't seem to be anywhere in the 1900 census in Hamilton County, Indiana (with either of his parents' families) so it seems likely that Fred was actually born about 1904 in spite of many records (including his own) showing earlier dates. Hinshaw, Fred, head-of-household, age 23, born in Indiana; parents born in Indiana; rented home; occupation: laborer, factory. Hinshaw, Mae, wife, age 19, born in Ohio; father born in Ohio; mother born in Kansas. Hinshaw, Lois, daughter, age 2, born in Michigan; father born in Indiana; mother born in Ohio. 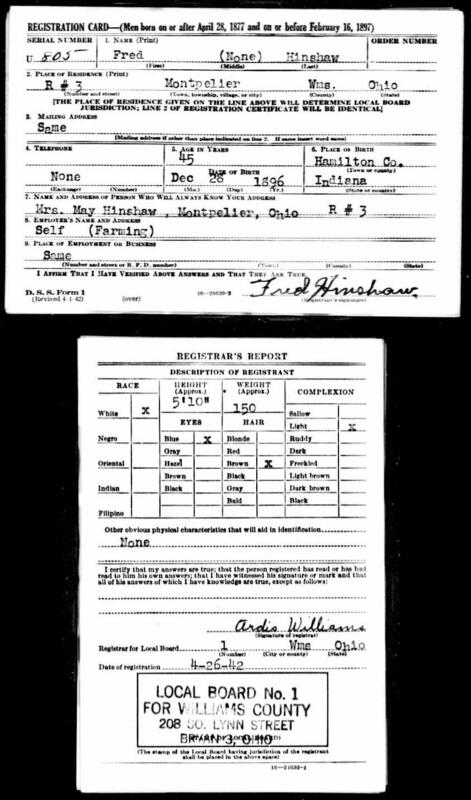 Hinshaw, Fred, head-of-household, age 33, born in Indiana; parents born in Indiana; first married at age 19; rented home; no radio in home; occupation: farmer, general farm; not a war veteran. Hinshaw, R. Mae, wife, age 30, born in Ohio; father born in Ohio; mother born in Kansas; first married at age 16. Hinshaw, Lois E., daughter, age 12, born in Michigan; father born in Indiana; mother born in Ohio; attended school. Hinshaw, Norma I., daughter, age 8, born in Michigan; father born in Indiana; mother born in Ohio; attended school. Hinshaw, S. Douglas, son, age 7, born in Ohio; father born in Indiana; mother born in Ohio; attended school. Hinshaw, B. Joan, daughter, age 4 years 11 months, born in Indiana; father born in Indiana; mother born in Ohio. Hinshaw, Donna L., daughter, age 2 years 9 months, born in Indiana; father born in Indiana; mother born in Ohio. Hinshaw, Fred, head-of-household, age 43, born in Indiana; completed 8th grade; on Apr 1 1935 was living in the same house; rented farm ($12/month rent); occupation: farmer, farm. Hinshaw, Mae R., head-of-household [sic], age 40, born in Ohio; completed 7th grade; on Apr 1 1935 was living in the same house. Hinshaw, Norma I., daughter, age 18, born in Michigan; completed 3 years of high school; on Apr 1 1935 was living in the same house; attended school. Hinshaw, Stephen D., son, age 17, born in Ohio; completed 1 year of high school; on Apr 1 1935 was living in the same house; occupation: laborer, farm; worked 52 weeks in 1939; $540 wages in 1939. Hinshaw, Betty J., daughter, age 14, born in Indiana; completed 8th grade; on Apr 1 1935 was living in the same house; attended school. Hinshaw, Donna L., daughter, age 12, born in Ohio; father born in Indiana; mother born in Ohio; completed 6th grade; on Apr 1 1935 was living in the same house; attended school. 1920 census, Jackson City, Jackson County, Michigan; roll T625-773, ED 28, page 7A, line #10, dwelling #135, family #161. Contribution from Gerry Ruihley <>.